No more than two rows of Frac, plus 1u Metalbox mult/atten panel, plus Wiard 311 new controller. Total of 9u to go in a sloping purple Nice-Racks wooden case. Will probably start with Blacet 6u rack, 2 x VCOs, VCS, Noise Ring and Boogie, then fill both racks with the remaining modules, then mult/atten panel, and finally the 311. In no hurry to complete it quickly, work in progress, will probably change a lot as it grows. Main use will be drones and textures, with the possibility of adding some kind of MIDI/CV in future for Berlin School type stuff. What do you reckon? I feel like a newbie again! Even nicer to see you getting back into frac. That looks, to me, like a well thought out drone machine. When you expand with the extra 3U, maybe some logic modules or a Bi-N-Tic could expand the sonic palette. The Bi-N-Tic in particular as it is both an oscillator AND a filter. nice, tho i think i'd trade out one of the quadVCAs for another modulation source. a number of these modules are out of production, have you sourced them used? Welcome back to the Frac club. I agree that you could use more modulation sources. but I think you're still light on envelopes. but a Boogie, JAG, and Noise Ring will be a lot easier to find there used. I think they will probably run on 15v. You could add 1 rack of just Malekko/Wiard and be happy. On the other hand, the new version of the Wiard JAG controller looks beautiful, and has extra LFOs. replace one VCO with morphing terrarium. then you will have a wavetable drone synth (ala VCO > Miniwave, but a bit different sounding, better imo) or a very unique modulation source great for interesting slow drone stuff. Thanks Adam, great to be back in Frac! There is no chance of another 3u I'm afraid. I'm determined to keep it small with 9u being the absolute maximum for everything (two rows of Frac, a 1u mult/attenuator panel and the 311). Will look in to the Bi-N-Tic! Used to have a pair, and did like them, it's a possibility for the future, but not right now. Will probably just sequence via PC software and a MIDI/CV. Yes, it's a REAL shame not to have an ENV 1 in there, as I know and love that module a lot, especially as an extra slow LFO. However the VCS came up, which is a lot more versatile, and I think I'd rather have that than an ENV 1. But it's a very hard choice, for sure... Also, as mainly a drone machine, not so much need for multiple envelopes, and then when I do go Berlin School I'll really only need one I reckon, and the combination of the VCS and the Super VCA should make for an insane amount of possible envelope shapes. Yes, as above, I reckon 2 x Super VCAs pretty essential to my way of working. And the 311 will add two LFOs. No chance of any Euro until hell freezes over, I'm afraid. Great suggestion, will look into the Morphing Terrarium. Thing I'm worried about with digital oscillators is horrible aliasing, particularly when using as an FM modulator for an analogue VCO. Can it be used as a standalone VCO or does it have to be 'driven' by an actual VCO like the MW? It will be a definite no if that's the case, as a drone with just one VCO is not much of a drone I reckon! But it could be a cool/different sound source and LFO, like you say, and I trust your ears when you say it sounds better than the MiniWave. Yes, have thought about swapping out the KlangWerk for the SynthTech digital frequency shifter one (which one is that, Deflector Shield?) That will probably be one of the last modules, so lots of time to decide. But they all go against my (perhaps misguided) analogue purist ethos! Thanks so much for all the suggestions, great to be back and great to see Frac community still going strong! OK, just read the descriptions of the Morphing Terrarium and the Deflector Shield, answered all my questions, and agree, both would be pretty insane in a drone setup!!! Check pic above to see changes. 2 micro LFOs redundant surely if you get a 311C with 2 LFOs/gates? -1 for PC sequencing ! Cheers, SynthTech MT looks amazing on paper. Will listen to demos when I get around to it, DS too. I don't think four LFOs and a looping envelope is overkill for a drone box, do you? Can create some really great, evolving modulation this way, to give life to the drone! Yeah, sequencing is not the main thing with this system, so that can all be sorted out later. Might do another little separate sequencing frac with MIDI/CV and Hex Zone etc. PC would be a stop gap, would be using Seq303. 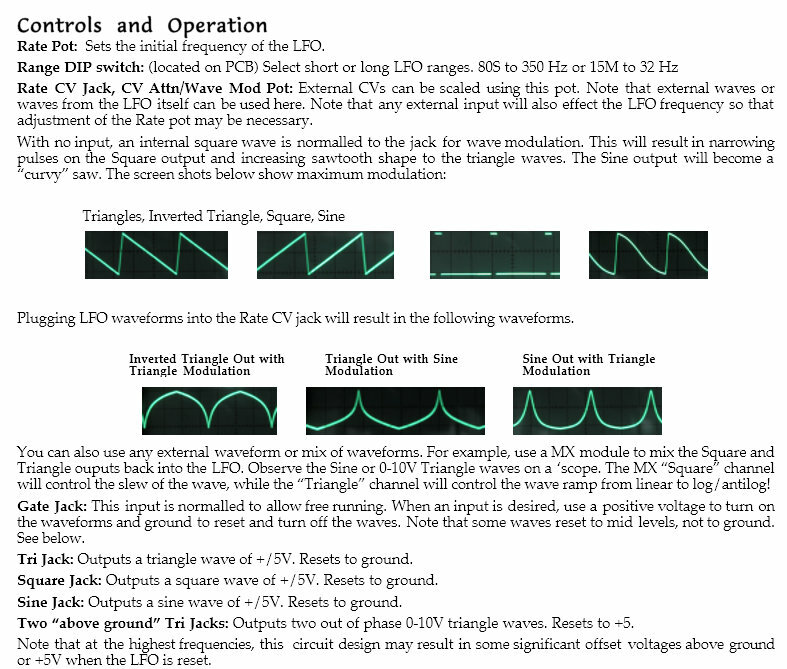 I don't think the microLFO's functionality can be easily replaced by other LFOs. I can't imagine my system without it. It truly is a king among LFOs due to it variable CV-controlled waveshapes, incredible frequency range and variety of outputs (0-10V & +/-5V). Don't forget that you can use it as a triggered EG with the gate input. You a create a fantastic range of EG shapes: instead of independently controlling A & R, the waveshape pot changes the A & R simultaneously. And by feeding the other LFO outputs back into the waveshape, you get an even wider range of exponential and linear envelopes. *** The only catch is that the outputs that can act as an EG (ie. they reset to 0V) are only 0-5V. BUT since you're using SuperVCAs with Lin/Exp controls, I'm sure you can work around this. For my drones I don't use that many envelopes, and the similarities between the Controller LFOs/gates and the Blacet LFOs would bug me... maybe a used EG1 might serve you well. The Morphing Terrarium is as good as a wavetable gets IMO. I'm not sure to what extent the core is itself analogue. PC sequencing, yeah it depends on your needs but on a budget it would probably be the thing that I would drop out as digital really can't do oscillators and filters. If you can't find a Moog filter, the Livewire Frequensteiner really is te best sounding filter I've ever heard. The diode ladder circuit and in particular the resonance is utterly unique. That in highpass mode for sound and clean Boogie for shaping = ?! yep, well aware of the amazingness of the blacet micro lfo, used to have four in my old system, it's an insanely great module. i think the micro lfos stay, whatever, i love them so much and would always want at least two in a system. the 311 quadrature lfos would just be icing on the cake. am usually using them for normal lfo duties though, so i would still want a decent EG, and that would either be the EG1 or the VCS. have owned both before, and the VCS seems more versatile, so will probably go with that. i also don't use many EGs for drones, and so one would suffice. the more lfos, the better though! synth tech MT and DS would be saved for last, probably, as they are yucky digital, haha! will check frequensteiner! had the metalbox steiner filter but really didn't like it, was very "dirty" sounding. so, NR and Boogie first, need to send payment this week, also need to find rack and power supplies, need to see if they are still available in the BST, otherwise from blacet new. also VCO and VCS need to send payment this week. might be a nice starter system anyway! Also dying for a Bananalogue 3P if anyone has one! I agree about the pair of Blacet Micro LFOs. It's one of the best LFOs in any format. Then I need to scout about for racks and power supplies, if I can't find any second hand I'll order a Rak2 and two Micro LFOs from Blacet direct. Need to source and squeeze a 3P in there too, if possible. I suddenly remembered how amazing it was the other day, and absolutely needed for switching positive to negative (and vice versa), as I don't think there's anything else in my proposed system which can do that. I think the Blacet Mixer Processor does pretty much the same thing as the 3P plus offset, extra independent channel, and LEDs to meter. You would have to repanel it to fit in the same space however. The rare BugBrand DC mixer is another nice option. It can be 2x 2channel mixers, or 1x 4channel mixer. Hi Gregg, just seconding what others have said about the Morphing Terrarium.... I'd say it's almost an essential module in a frac system focused on producing interesting sounding drones. It's one of the main uses for which I've employed mine, especially multing the output to two different delays and panning hard left/right with slow lfos morphing between waveforms - gorgeous sounding stuff, and definitely no nasty aliasing! Sounds exactly what I'm looking for! and nothing else, not even a power supply or rack. And even that's in the UK! Will slowly add things as and when I can afford a couple of hunrdred bucks here and there. Am in no hurry to finish a system quickly as I have loads of other things taking priority right now (Towersonic stands, which have been ordered, and a load of acoustic treatment panels from GiK, which haven't). But hoping to have something pretty similar to my rack planner setup within a year or two. I have two 3Ps but I'm hanging on to them. I used the WVX for the first time properly - mine has "the problem" (ie it's silent or noise for a good third of the folds travel) but I'm not well situated to get it fixed. Even so I found it gave me what I was looking for in the track I was working on. Still only have the VCS but still wanting to end up with something similar to the two rack system I had planned on the previous page. Probably drop the Boogie and Noise Ring, try and find a couple of 3Ps. Add a 1u panel from Metalbox with mults, attenuators, and possibly even a Real Ring Mod, white noise source, and Midiverter, if possible. Hardly any Frac in the Trade section here at the mo. Still hoping to pick up most of it second hand. OK so old rack, ps505 and 8008 on their way and hoping for a 1490 filter very soon! I also have a 1490 - in fact I think you were one of the people that advised me about that and the 1190 VCA. You mentioned "real ring mod" - is that a specific moule - or is that some ring mods are different from the original types? I have an Oakley Ring mod which I think is a real ring mod - and a klangwerks which I thought I read somewhere is a different design?